You are invited to attend!!! Physicians of all specialties, dentists, optometrists, nurses, PAs, medical students, and others are welcome! 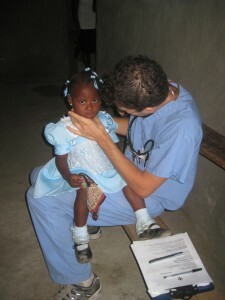 Medical volunteers will be involved with seeing patients and providing appropriate treatment regiments and follow-up. We welcome all specialties and encourage those with surgical or dental skills to join us! We run a primary medical clinic, including pediatrics and psychiatric care, to treat as many people as possible. Non-medical volunteers can be involved in activities such as eye glass fitting, interpreting (French and Spanish speakers are welcome), and education projects. We are always open to suggestions for new projects. Cost is $500 for transport, food, and lodging. Plane arrangements from Miami to Port au Prince (PAP) are booked separately by each participant. All participants must be on the same flight from Miami into Port au Prince. A current US passport is required. No visa is necessary for US citizens. Teams are housed in “Lakay Missionaire,” a large house in the village. There are mattresses in each room, which hold 3-4 people per room. Running water is available for one shower a day. Drinking water is provided. The community prepares local Haitian dishes including rice, beans, chicken, goat, and plantains for three meals a day. Email santetotal.healthcare@gmail.com for more information. You will also need to read and complete the following three documents.